LD is the colourful biography of Louis Taylor, the longest-serving mayor in Vancouver's history; he was first elected mayor in 1910, and served off and on until 1934, for a total of eleven years. Taylor's story is also the story of Vancouver in the early decades of the 20th century, a young city experiencing a turbulent adolescence. Louis Taylor, or LD as he was known, arrived in Vancouver from Chicago in 1896 at the age of 39. He got involved in the newspaper business, first as an executive with The Daily Province, then as proprietor of The World, during which time he built the World Tower, which remains one of Vancouver's landmark buildings (now better known as the Sun Tower). He launched his political career in 1902 when he ran successfully for licence commissioner; it was the first of 26 civic elections in which he ran, including 20 for mayor. In his early political life he was considered "the workers' friend" and was opposed by the city's business elite, who portrayed him as corrupt. He also had a reputation for being soft on crime, and was implicated in a 1928 police investigation that lost him an election. But his achievements included the establishment of the airport, a town planning commission, and the water board. His private life, however, was another story, a virtual soap opera that mirrored the ups and downs of his political career; his wife was addicted to opium, and he found himself mired in bigamy and divorce scandals. As Vancouver grew from small frontier town to a major international port city, LD saw the city through the Depression, and in a sense Vancouver grew up under his tutelage. 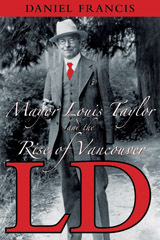 LD: Mayor Louis Taylor and The Rise of Vancouver vividly documents the life of a man who dominated the city for years, and the integral role he played in shaping the Vancouver of today. "Daniel Francis' biography of former mayor Louis Taylor is one of the most significant Vancouver books of the last several years." "... the author shows how man's (sometimes misguided) passion and zest for public life planted the seeds of the beautiful and infuriating city we know today." "L.D. deserves to be read by people with no special interest in the West Coast, simply on the grounds of excellence and as a piece of political history."